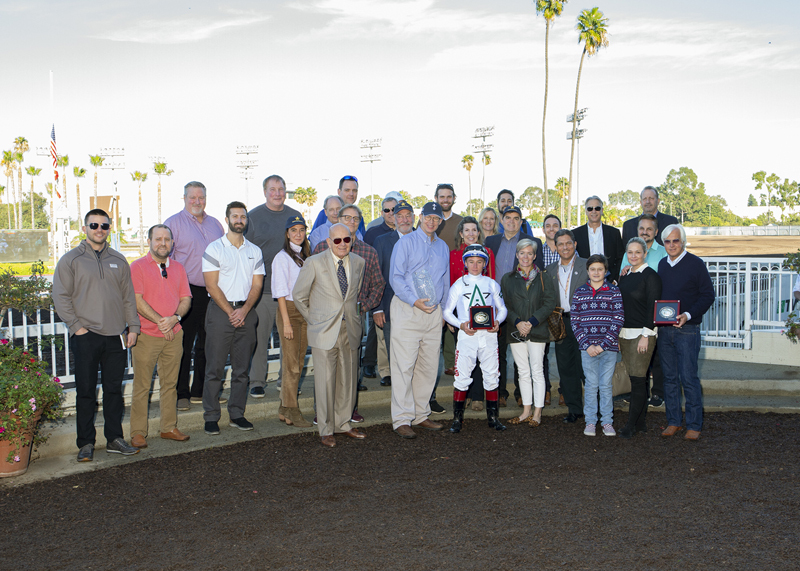 CYPRESS, Calif. –A second consecutive sweep of the Grade I Los Alamitos CashCall Futurity and Starlet by Hall of Fame trainer Bob Baffert highlighted the Winter Thoroughbred meet, which concluded Sunday.Complete business figures for the eight-day season won’t be available for several days. Field size rose over the Summer Thoroughbred Festival in July and the Los Angeles County Fair meet in September with an average of 7.44 starters per race. Baffert, who became the first trainer to win the CashCall Futurity and the Starlet in the same year in 2017 when McKinzie – via the disqualification of stablemate Solomini – and heavily-favored Dream Tree won the two prestigious events for 2-year-olds, repeated the feat this year with Improbable in the Futurity and Chasing Yesterday. Improbable’s five-length victory was Baffert’s 11th in the Futurity, which was run at Hollywood Park between 1981-2013. The trainer has won all five renewals of the race at Los Alamitos, scoring with Dortmund (2014), Mor Spirit (2015) and Mastery (2016) prior to the successes by McKinzie and Improbable. A son of City Zip and the A.P. Indy mare Rare Event, Improbable is 3-for-3 for a partnership that includes WinStar Farm LLC, China Horse Club International Ltd. and Starlight Racing and has stamped himself one of the early favorites for the 2019 Kentucky Derby. In her first start beyond seven furlongs, Chasing Yesterday, despite racing wide throughout, was up to defeat longshot Enaya Alrabb by a head for owner-breeder Janet Lyons’ Summer Wine Equine. A half-sister to 2015 Triple Crown winner and Horse of the Year American Pharoah, Chasing Yesterday, a daughter of Tapit, is undefeated in four starts in California. Baffert also shared the training title for the meet with Doug O’Neill and Hector Palma. They each had four victories. It was the eighth time Baffert has either led or shared the title at Los Alamitos since thoroughbred racing returned in July, 2014 and the seventh time for O’Neill. Baffert had the most wins (15) for the year at Los Alamitos, combining the Winter meet with the Summer Thoroughbred Festival and the LACF season. Apprentice Heriberto Figueroa and Tyler Baze tied for leading rider with eight wins apiece. Figueroa shared the Summer Thoroughbred Festival title with Assael Espinoza and was also the top jockey at the LACF meet. 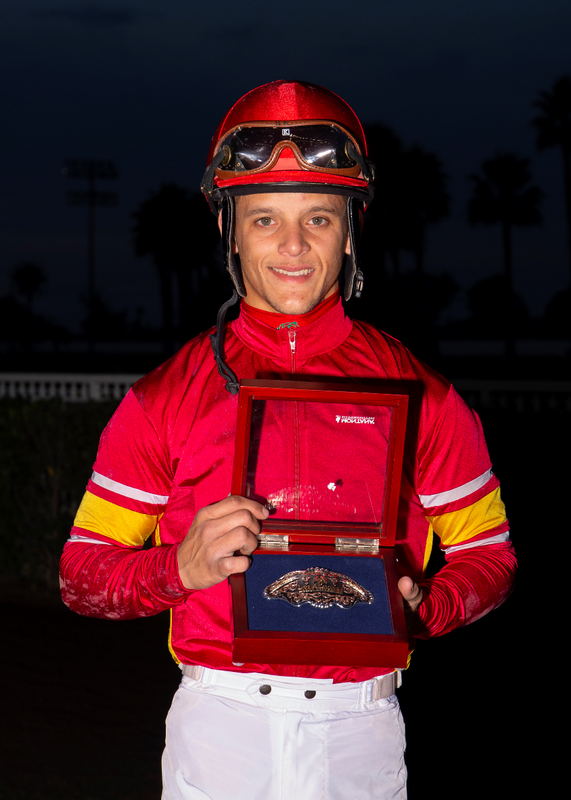 A 19-year-old native of Bayamon, Puerto Rico, Figueroa finished 2018 with 35 wins at Los Alamitos. He totaled 12 during the Summer meet and 15 in September. 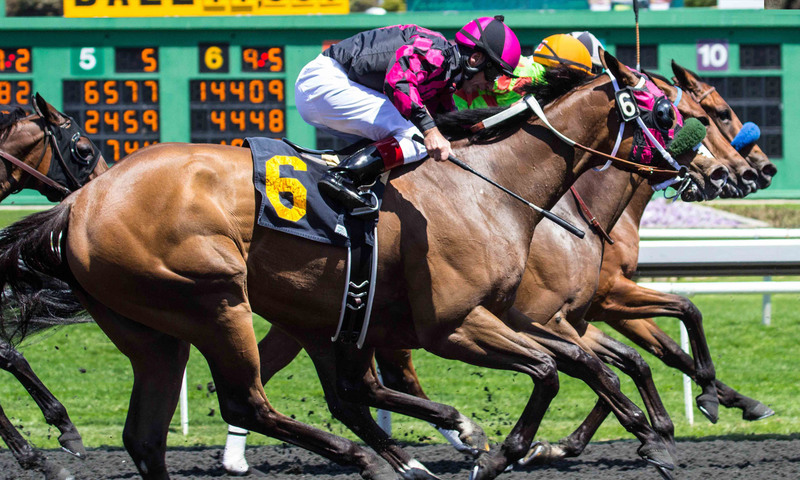 Thoroughbred racing will return to Los Alamitos for three meets in 2019. The Summer Thoroughbred Festival will begin Thursday, June 27 and continue through Sunday, July 14. The Los Angeles County Fair meet will commence Thursday, Sept. 5 and conclude Sunday, Sept. 22 while the eight-day Winter season will start Thursday, Dec. 5 and wrap Sunday, Dec. 15. The first two meets are 12 days long. There will be a Pick Six carryover of $39,345 when racing resumes Sunday at Los Alamitos, the final day of the Winter Thoroughbred meet. There is also a carryover in the Super High 5 of $8,273. Since it is closing day, there will be mandatory payouts in the Pick Six as well as the Players’ Pick 5 and Super High 5. The Pick Six begins in the fifth race Sunday. Post time is 12:30 p.m. and scheduled post time for the fifth 2:28 p.m. There will be a Pick Six carryover of $36,876 Thursday at Los Alamitos. There is also a carryover of $7,815 in the Super High Five. The Pick Six begins in the third race Thursday. Post time is 1 p.m. and scheduled post time for the third is 1:58 p.m. The Super High 5, a $1 minimum wager, which requires a player to correctly identify the first five finishers, will be offered – as usual – in the final race. Scheduled post time for Thursday’s eighth is 4:28 p.m. There will be a Pick Six carryover of $37,876 Thursday at Los Alamitos. There is also a carryover of $7,815 in the Super High Five. The Pick Six begins in the third race Thursday. Post time is 1 p.m. and scheduled post time for the third is 1:58 p.m.